The Serenity Prayer is the common name for an originally untitled prayer that has been frequently attributed to the theologian Reinhold Niebuhr. The prayer has been adopted by Alcoholics Anonymous and other twelve-step programs. I found this lovely video of the Serenity Prayer which I thought you might like. Relax and enjoy! Is there anything in this situation that I can change now? Yes – What would be a reasonable next step to take to remedy difficulty situation from where I am standing now. No – Ask God to grant you the serenity to accept the situation. Notice, in both cases, action or change is required, be it taking a tangible step or moving into a place of acceptance of the situation. I’ve provided a collection of quotes on action, change and acceptance to help you. Frequently knowing what to do and actually doing it are two different things. Humans are creatures of habit and often find it difficult to do the right thing even when they know what the right next step would be, that is where courage comes in. I’ve provided a collection of quotes on courage to assist in this process. There can be a lot of confusion when in a difficult situation with everybody putting their 2 cents in on how to handle the situation along with your pride and ego getting in the way of seeing things clearly. Wisdom is truly required to be able to look at a situation and discern the best course of action for ALL individuals involved. I’ve provided a collection of quotes on wisdom by some of the wisest people throughout history to help you develop this character trait. 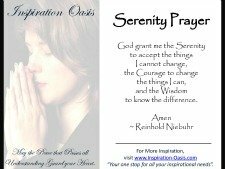 If you are in need of some peace in your life in the midst of difficulties, the Serenity Prayer Poster may be a good tool for you to get and keep you grounded in difficult times and determine the things in your life you need to accept and the things in your life you need the courage to change. Hopefully you will be able to find a poster in this collection that speaks to your soul.